3G-324M is used for multimedia-based services that packet-based wireless networks cannot deliver because of inherent overhead, BER sensitivity, and variant routing delays. 3G-324M operating over a circuit switched channel between communication peers guarantees fixed-delay QoS for multimedia communications. The combination of circuit switch 3G-324M services with packet-based SIP services, such as presence and instant messaging, leverages the strength of both networks to enable new and differentiated innovative mobile 3G services. Our 3G-324M Toolkit includes a set of APIs to develop multimedia communication solutions for 3G servers and handsets. 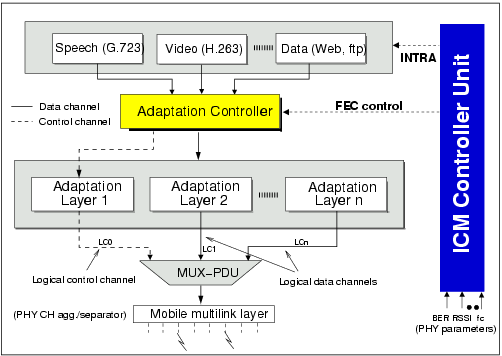 It can also be used to develop multimedia-based solutions for UMTS, TD-SCDMA and CDMA2000 networks. Together with the ICM controller unit, The 3G-324M Toolkit delivers very high performance with a small memory footprint. H.245 AutoCaps add-on, allowing automatic capability negotiation and channel opening. In essense, the 3G-324M toolkit for Handsets is the ideal solution for developing a wide range of handset products, such as 3G desktop terminals, 3G PDAs, smart phones, feature phones and 3G cellular phones.